I have to admit I kept changing my mind who to put No. 1. I love Irish War Cry and hated lowering him after only one week. Although he has shown more brilliance, I have absolutely no questions regarding McCraken, and his style of running and powerful turn of foot stamp him as a true Derby horse. And he’s 3-for-3 at Churchill Downs and jumped 9 Beyer points to a 95, indicating he’s made tremendous progress from 2 to 3. Even more impressive was that Wilkes said he wasn’t fully cranked for the Sam F. Davis, in which he was giving everyone but the last-place finisher 6 pounds. In the race, he went his first half in :48 and the next half in :47 3/5, while circling the field with his patented big sweeping move before coming home in :06 2/5, being shown the whip a couple of times and finishing the final yards pretty much in hand. When they’re not fully cranked and come back blowing a little, as he was, you know they got a lot out of the race, especially over a track like Tampa that puts a lot of bottom into a horse. Galloping out, he kept going and Brian Hernandez had to steer him to the outside fence entering the backstretch to get him to a full stop. What made his come-from-behind victory even more impressive, in the only two other dirt races of note on the card, a 9-1 shot won the two-turn Suncoast Stakes on the front end zipping the half in :45 4/5, and a solid seven-furlong maiden race was also won on the front end with fractions of :45 flat and 1:09 4/5. Combine that with pacesetting State of Honor holding on for third in the Sam Davis at 11-1, beaten 2 1/2 lengths, and it seems pretty apparent the track was conducive to speed. McCraken also proved he can win over a quirky surface like Tampa, turning in the same explosive kick he demonstrated three times at Churchill Downs. As for breaking the track record in his first start back in February, the way he did it, and with two horses finishing right behind him, I’m not paying much attention to the final time. He seems to be the kind of horse that can maintain his form and keep moving forward. I believe he gets that from Nodouble in his tail-female family. He was one of the toughest and most durable horses I’ve ever seen and passes on that quality. Wilkes said he learned from past Derby winners Unbridled and Street Sense, you just enjoy the ride, stay out of your horse’s way, and let him take you there…if he’s good enough. And this colt certainly looks good enough. I will state right now that if he wins the Fountain of Youth from off the pace and does it with style, as he did in his sensational maiden score, he will return to No. 1. He could even return before then. That is the only thing separating him from McCraken, as they are virtually deadlocked for the top spot. Can we call this a tie and make everyone happy, especially me? I still feel this colt is the only 3-year-old I’ve seen with superstar potential, he looks that gifted. And I feel we haven’t seen anywhere near the best of him. But unlike McCraken, he still has a few things to work out in addition to settling off the pace (there are a number of fast, classy pace horses this year). In two of his three starts, when he was farther off the rail turning for home, he was late changing leads, and had to be helped by Rosario in the Holy Bull, and he also needs to keep a straighter course in the stretch on a consistent basis. With a big stride like his and running with his head up, sometimes you get stuck on your left lead when you take the turn wide. But when he levels off in the final sixteenth he’s beautiful to watch. If he can run like he has while still being a bit green, imagine what he’ll be like when he gets more professional. He’s been in a slugfest already, coming out on top, so we know he’s a fighter. As for settling off the pace, all Motion could provide is, “Hopefully he’ll settle.” So even the trainer can only hope he’ll take back as he did in career debut. His maiden race was so impressive, and his move so explosive, he had star quality written all over him. Like Motion, we’re all hopeful we’ll see that kind of performance again. Motion, who at first was reluctant to commit to both the Fountain of Youth and Florida Derby, but who now says he plans on running in both, is one of those trainers who you’re always confident will make the right decision. There is no doubting this colt’s class, raw talent, and pedigree, and he has the temperament to handle anything Churchill Downs will throw at him. He’s in the hands of a master horseman, who did wonders with Animal Kingdom, and “hopefully” this colt will answer these final questions. If he does there is no stopping him. This is a colt who has been for the most part forgotten, mostly because he’s still a few weeks from a race and there hasn’t been much hype surrounding him, so much so that he’s ranked at No. 8 on the weekly NTRA poll. Dutrow obviously feels he only needs two starts, and one would think his final prep would be the Wood Memorial, having won the Remsen over the Aqueduct track. So do you run in the Gotham Stakes March 4 over the inner track or take advantage of Fair Grounds’ long stretch in the Risen Star Stakes a week earlier and then ship back up north? Word has it that it looks as if Dutrow is more enamored with the Fair Grounds stretch than the inner track and will head down south, where there is no standout among the locally based horses. When you have only two starts to play with, there is little or no margin for error and makes the decisions tougher. He turned in a strong 5-furlong breeze in 1:01 3/5 over the deep Payson Park surface and obviously is progressing beautifully. This colt has done nothing wrong, and, like McCraken, has demonstrated a perfect running style for the Derby, as he can lay fairly close to the lead or take back farther, depending on the pace. Either way, he can deliver a powerful knockout punch. We were anxious to see if No Dozing would uphold the form of the Remsen Stakes, but he was never in contention and just ran a dull race, so no help there, at least nothing positive. Mo Town’s tail-female family possesses a combination of sprinters and middle distance horses and his fifth dam is a full-sister to Raise a Native. Nothing to do with him but wait. The rains in Southern California continue to play havoc with training schedules, and could be one of the reasons why so few 3-year-olds are being entered. His work schedule had been sporadic, with gaps of 20 days and 12 days, and after stringing together several works at regular intervals he’s back at the top of his game, as indicated by his sharp 7-furlong drill in 1:25 2/5. Two years ago we had to wait what seemed like forever for American Pharoah’s debut, and the same goes for Mastery, whose true talent still is unknown, other than what we’ve seen against lesser competition, although we really don’t know yet how good Cal-breds Ann Arbour Eddie and California Diamond are. They did come off their defeat to Mastery in the Bob Hope Stakes to finish a strong one-two in the Cal Cup Derby. And the maiden Arap, who he trounced in the Los Alamitos Futurity, came back to run second to Royal Mo in the Robert Lewis Stakes, after surprisingly finishing fourth in a maiden race. So we really have no idea what he’s been running against. To his credit, he seems to do everything like a good horse, and as of now he appears to have more raw talent than any of the Baffert’s 3-year-olds, although we still have no idea how good American Anthem is. Like American Pharoah, Mastery has a beautiful way of moving and makes a grand appearance. He also has the look of a horse who wants a distance of ground. 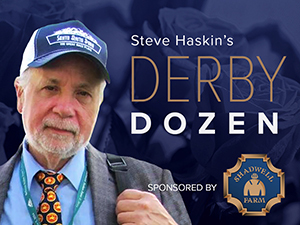 So we’ll just have to wait and speculate where he fits in the Derby picture. With brilliant horses who can control a race on the lead and are bred to run long such as Irish War Cry, Uncontested, Gormley, and Royal Mo and two very fast horses who are also bred to run long in American Anthem and Iliad, you don’t want to be committed to the lead, and Mastery is another who needs to show he can rate behind horses. There are still a ton of questions regarding his performance in the Holy Bull Stakes. What percentage of his dull effort can be attributed to his foot abscess and what percentage to his fretting in the van, sweating badly before the race, and becoming agitated at the gate? Can an abscess cause all that mental anguish prior to the race, going all the way back to the morning van ride? I obviously have no idea. Casse said, “It’s one thing when you’re walking and you're jogging at a slow pace. It’s another when you're running at 40 miles per hour. It had to have been brewing. I wonder if that's why he got so upset and didn't run better.” It sounds as if Casse is saying it’s a distinct possibility the two are tied together, and that gave him a sense of relief. He must be confident they are because he said the Fountain of Youth Stakes is back in the picture after initially saying he most likely would not run anymore at Gulfstream, where he’ll have to van down again the day of the race. But there’s no reason why he couldn’t van down a few days earlier. There is no doubt the abscess affected his performance in the race, but is there no doubt it also affected his behavior starting back on the van ride in the morning and continuing through the post parade and getting in the gate? If you want to forgive him 100 percent, you’re just going to have to chalk it up to having a very bad day, mostly due to the abscess, and just throw the actual race out. The only facts one has is that he has had a history of temperament issues on some days and being the perfect gentleman and all class on other days. He seems to be great around the barn. If you’re confident he’ll be on his best behavior on Derby Day, and that both the abscess and his pre-race antics are tied together and conspired to cause his poor effort, then you have to still rank him right up there near the top. He deserves the benefit of the doubt. Not only did I love the way he was striding out at the end of the Holy Bull Stakes, with great determination, I love the fact he was able to maintain the same distance between himself and Irish War Cry from the eighth pole home, as the winner was drawing well clear of the rest of the field. Although his pedigree is loaded with class and stamina influences on top and bottom, he still was able to close fast to be second to last year’s king of Florida, Three Rules, in his career debut going 5 furlongs and coming home his final eighth in :12 flat. In the only race you can criticize him for, his fifth-place finish in the Breeders’ Futurity, he showed a quick turn of foot on the far turn, but his momentum carried him 6-wide turning for home, while under an early right-hand whip, and he failed to sustain his move. He’s now ridden by Javier Castellano, who has ridden him three times, winning two stakes and finishing second in the Holy Bull. He does need to get faster on his Beyer figures, but his Thoro-Graph figures put him on a good progression, and his pedigree strongly suggests he’s going to get better as the distances stretch out. He continues to train well, breezing 5 furlongs in 1:00 4/5 at Palm Meadows. It looks as if Brown will point him for the Gotham Stakes for his long-awaited debut. The question with him is still the distance, as doubters believe he is a one-turn horse, based on his strong rallies in the grade 1 Hopeful and Champagne Stakes, and his non-threatening third, beaten nearly 8 lengths, in the Breeders’ Cup Juvenile, along with his sire’s two best horses, Goldencents and Vyjack, both being milers. However, when bred to a mare with a good deal of stamina in her pedigree, he was able to get Vicar’s in Trouble, winner of the 1 1/8-mile Louisiana Derby and Super Derby, and Goldencents did stretch out early to win the Santa Anita Derby. Practical Joke’s female family unfortunately doesn’t help us either way, as it has both speed and classic influences, but not a ton of pure stamina. On the speed end you have the sprinter and sprint influence Gilded Time, and to counteract that you have broodmare sire Distorted Humor, who sired a Kentucky Derby winner (with the help of a stamina-laden female family), and Sunny’s Halo, who won the Kentucky Derby. But is there enough stamina in his female family to push him that extra eighth or quarter of a mile? Practical Joke’s only inbreeding is to mostly stamina influence Halo in his fifth generation. So it looks as if it’s going to come down to talent. No debut this year will be as helpful determining a horse’s Derby status than that of Practical Joke. But we still may not know much about him until his final prep at 1 1/8 miles against top quality competition. Judging from what we’ve seen from him in the Hopeful and Champagne, if he can be right there at the eighth pole he may just have the fight to get him home. The main question is how do you go about beating this horse, who has the ability to run you into the ground early while apparently taking little out of himself? Three races is a small resume, but so far he hasn’t exactly flown home, although he hasn’t had to. If he’s going to be beaten it’s going to be by a very good horse, who can withstand his early pace and still be able to come home in fast time. For example, in the Smarty Jones, Uncontested pretty much buried his opponents with fractions of :46 1/5 and 1:10 3/5; extremely fast for Oaklawn Park. His :25 3/5 closing quarter might have made him a bit vulnerable in the final eighth, but he had already knocked out those chasing him and put enough distance between himself and any potential late closers in the field that they were unable to make up any ground. The fact is he was never threatened, except for a brief mild challenge from Petrov, and was drawing away from the field. In short, I believe we’ve only seen the tip of the iceberg with this colt. Petrov, who is a very good horse who pulled well clear of the others, was under a full-out drive trying to close ground, while Uncontested was merely cruising along. That’s where that high cruising speed becomes so important and intimidating. Considering that distance should be no problem for him, it will be interesting to see what strategy the connections of Petrov and the others come up with in the Southwest Stakes. On the other hand, we’ll see if anyone is brazen enough to try to run with him early, which appears to be the only chance the others have to beat him. He breezed 5 furlongs in 1:02 2/5, which Shirreffs called “an excellent work.” He says he lets Gormley breeze as he likes and that once he catches his workmate he goes to cruise control, and that this latest work was less about time and more about his frame and stride. As Shirreffs says, “Perfect form leads to perfect function.” One promising aspect of Gormley’s Sham Stakes victory was that he was able to sit behind American Anthem, which was a big step in the right direction. Now it’s just a question of which direction Shirreffs goes with him and stablemate Royal Mo, wire-to-wire winner of the Robert Lewis Stakes. At this time, the San Felipe Stakes is considered a possibility for Gormley. It is interesting to note that Gormley’s Thoro-Graph figure in the Sham was the fastest by any of the top Derby contenders before last week (we haven’t seen any figures for Feb. 4) and was actually several points faster than American Anthem, despite the head margin. As we’ve been saying, his female family is inundated with stamina. But like some of the others with brilliant speed from on or just off the pace, this looks like a good year to have a horse who doesn’t need to be on or near the pace and can relax behind horses. When he was forced to take back after bobbling at the start of the Breeders’ Cup Juvenile, he tired badly, beaten more than 16 lengths. That is why it was so important to see him sit just off American Anthem in the Sham and fight it out gamely the length of the stretch. Right now he’s proving to be a winning machine, and that’s all you can ask of a horse. The big question with him is whether he will skip the Gotham Stakes and go straight to the Wood off a two-month layoff. Most trainers nowadays shudder at the thought of giving a horse four preps before the Derby, despite it being the norm years ago. We should be thankful when they have three, which is one more than most of the top contenders have each year. These days you see more and more trainers giving horses two-month “vacations” right in the middle of the Derby trail. If they can win the Derby, more power to them. What this colt has going for him is his ability to come home, as evidenced by his closing fractions of :24 flat and :06 flat in the Withers, but let’s see what happens when they’re not going three-quarters in 1:14, as they did in both his stakes wins this year. I like the classic Sam-Son Farm breeding in his tail-female line and the inbreeding to Buckpasser, as well as tracing to Belmont Stakes and Travers winner Quadrangle. Baffert is putting some bottom in him, working him 6 furlongs in 1:13 2/5. There is no doubt the talent is there, as demonstrated by his gutsy effort in the Sham Stakes in only his second career start and coming off a neck victory going 6 furlongs. It should be noted that he did come from several lengths off the pace and made up 3 1/2 lengths in the stretch in his maiden win. And it could be said that the only reason he went to the lead in the Sham is that he broke from the rail in a seven-horse field, and Baffert loves taking advantage of the inside post going two turns. It would not be surprising if he did something extraordinary in his next start, but as mentioned earlier, he will be at a historical disadvantage going into the Kentucky Derby off only four career starts. If he is as gifted as his sire and can establish a clear lead with no pressure and open up 5 lengths at the eighth pole, he could have a shot to pull it off. But that doesn’t seem likely this year, so it would benefit him to be able to take back off the pace. He’s done it sprinting. It came down to what are better credentials, winning a grade 3 stakes like Guest Suite in the LeComte and Royal Mo in the Robert Lewis or finishing a fast-closing second to the No. 1 ranked horse, beaten only 1 1/2 lengths? If McCraken is good enough to warrant the top spot then Tapwrit has to be considered a legitmate contender, right? And he didn’t have the smoothest of trips, getting trapped on the rail by McCraken after turning for home and having to gear down to let him pass and then alter course to the outside. Once he leveled off he was running on strongly at the end and actually was in front of McCraken shortly past the wire. Although he was a $1.2 million yearling at Saratoga, my main questions with his pedigree are broodmare sire Successful Appeal, and as much as I love inbreeding to In Reality, he is inbred to In Reality’s two speed branches through Valid Appeal and the granddam of champion sprinter Rubiano. Frankly speaking, his first three career starts showed no indication he wants to go classic distances, but that was not a large sampling to go by. His Sam F. Davis performance, especially the way he was closing came as a total surprise, as his Beyer figures had been less than mediocre and he saw a 5-length lead at the eighth pole in the Pulpit Stakes in the slop shrivel to a length at the wire, but the horse closing on him, stablemate Master Plan, finished 12 1/2 lengths ahead of the third horse and then came back to win the OBS Championship. Pletcher did say Tapwrit been showing a lot of improvement. What he does have in his favor pedigree-wise is maternal great-grandsire Hawkster, a true stamina influence and the broodmare sire of Preakness and Belmont Stakes winner Afleet Alex. I still have some concerns about him when the distances stretch out, but I will chalk this effort up to a big improvement at the right time and liking the Tampa Bay surface, which some of the other contenders might not have. As everyone knows by now, I’ve been preaching in vain about the use of a sprint prep for seasoned 2-year-olds to start off their 3-year-old campaign. Despite the powerful historical trends of the past that were listed last week, this year’s Hutcheson Stakes didn’t even fill, the Swale Stakes drew only six horses, with no one in the field having any Derby aspirations, and then Sunday’s San Vicente Stakes, which proved to be the best Derby prep last year when the first two finishers went on to finish one-two in the Kentucky Derby, drew only five horses, all of whom had only won a maiden sprint race from 5 1/2 to 6 1/2 furlongs, thus pretty much putting them behind the eight ball as far as the Kentucky Derby goes. Although the field was small and no one had any stakes credentials, there were several colts who showed great promise. Going in, we knew that ILIAD, formerly trained by Bob Baffert and now in the barn of Doug O’Neill, was an extremely fast colt, having broken his maiden at Los Alamitos in 1:08 1/5. In the San Vicente he broke sharply and tracked blistering fractions of :21 4/5 and :44 flat, with jockey Flavien Prat pulling hard on the reins. The son of Ghostzapper eventually settled into a comfortable stride and Prat merely let him cruise to the lead and he took command and drew off after ducking to the inside. He hit the eighth pole with a 1 1/2-length lead in 1:08 2/5 under intermittent urging and was allowed to finish up on his own, winning by 3 1/2 lengths and covering the seven furlongs in a sprightly 1:21 3/5. The crash course to the Derby likely will continue in the San Felipe Stakes and then the Santa Anita Derby. We know the Ghostzappers come in all types, but there isn’t enough big names in his female family to indicate one way or the other how far he wants to go, but there are some stamina influences and he is a rare complete outcross through his first five generations. His tail-female great-grandsire Swoon and Swoon’s brother Sir Pele were both long distance stakes horses on the grass and his dam traces to Santa Anita Derby winner Ruken. Broodmare sire You and I won major stakes from 7 furlongs (in a track record 1:20 1/5) to 1 1/8 miles, including the Met Mile and Brooklyn Handicap. Speaking of fast horses playing major catch-up, the Todd Pletcher-trained MALAGACY, who romped by 15 lengths in 1:03 3/5 for 5 1/2 furlongs in his career debut, came right back and trounced an overmatched allowance field by 7 lengths after tracking fractions of :22 flat and :45 flat and winning on his own in 1:16 2/5 for the 6 1/2 furlongs. By Preakness and Met Mile winner Shackleford, out of a Dehere mare, his close up pedigree doesn’t exactly shout stamina, but he is inbred to Pleasant Colony and has a number of other class and stamina influences and traces to the hard-knocking Acorn and Mother Goose winner Deceit. His problem is timing, with only 5 1/2 and 6 1/2-furlong races under him, and being pure speed and showing no inclination that he’ll be ready to go 1 1/4 miles in less than three months. Even Pletcher said he looks as if he’s more suited to one turn. Looking back at the Sam F. Davis, STATE OF HONOR ran a big race with blinkers added, although I wasn’t crazy about the way he was running early on with his head up. Although he just kept going and gave way grudgingly for second, I thought he ran more like a Derby horse without blinkers in the Mucho Macho Man when he rallied from off the pace, even though he appeared to have the race won and let Sonic Mule come back and beat him. This was only his second dirt race, and he no doubt is a horse to take seriously. As for last year’s major stakes-placed 2-year-olds, WILD SHOT made a good move on the turn to challenge for the lead, but failed to sustain it, and NO DOZING, who got decent position breaking from the outside post, had an excellent trip but simply never fired. Trainer Arnaud Delacour said no excuses, and normally you would use the Tampa track as an excuse, but he had been training beautifully over it. The unbeaten FACT FINDING chased the pace, but began dropping back on the turn, eventually finishing fifth, beaten 9 lengths. At this point I have to believe Jerry Hollendorfer when he says UNIQUE BELLA will remain in filly races, and, although she looks as if she may be the most gifted 3-year-old regardless of gender, at least according to many, I hate to use up a spot in the Top 12 because I believe he doesn’t mean it or will change his mind. But I must say, the way this filly continues to annihilate her opposition, and do it with ease, and with her tremendous tactical speed and ability to settle behind horses, it is an enticing thought to try her against the boys. I trust Hollendorder’s judgment, but because so many feel strongly she should hit the Derby trail, I will play devil’s advocate. But first let me say that it is way too premature to compare Unqiue Bella to Songbird, who had accomplished far more at this point, including winning an Eclipse Award. With that said, I can’t help but feel the San Felipe Stakes would be an ideal race for Unique Bella, with little or no downside, other than losing a race, and I’m normally against running 3-year-old fillies against the boys this early. But as I said, we’re playing devil’s advocate. Why race for $100,000 in the grade 3 Santa Ysabel Stakes and win by a pole again when you can go for $400,000 in the grade 2 San Felipe just to see if she is indeed Kentucky Derby material. If she can knock off horses like Gormley or Royal Mo or either Mastery or American Anthem, she would establish herself as a clear-cut favorite for the Santa Anita Derby, a race in which Winning Colors romped by eight lengths before winning the Kentucky Derby. The 3-year-olds at Santa Anita are pretty thin depth-wise this year, with nothing but small fields, so a large field for the upcoming preps is unlikely. If she proves she can’t handle the boys at this time, she can always go back to facing fillies and would still be an overwhelming favorite for the Santa Anita Oaks run the same day as the Santa Anita Derby. Nothing really lost. Now for the more cautious and perhaps logical approach. She can get high strung and has had to have extensive paddock schooling, actually schooling eight consecutive days, and may not be ready for such a task after only four career starts. Also, with Iliad now thrown into the San Felipe picture, there will be at least three extremely fast horses in there, including possibly Gormley and either Mastery or American Anthem, and you would be asking a filly who has been toying with her competition to duke it out the entire race, which promises to be the proverbial barn burner. There will be supporters for both running and not running against colts, but the decision is up to Hollendorfer and the owner, and if they choose the easier and more traditional route then you just have to respect their decision and move on. They know what’s best for their filly. But the San Felipe does sound pretty intriguing. Although the UAE 2,000 Guineas is a long way from the Kentucky Derby, the top-class Godolphin colt THUNDER SNOW made an auspicious dirt debut by romping to a 5 3/4-length victory at Meydan, while extending his lead with every stride, despite not changing leads down that long stretch. A full-brother to a UAE Oaks and 1,000 Guineas winner, Thunder Snow had turned in some big performances in Europe at 2, most notably a 5-length victory in the group 1 Criterium International at Saint-Cloud, in which he seemed headed for a leap over the outside hedge before straightening himself out at the last second and bounding away from his field. In the UAE Guineas, he took the lead on the far turn and was actually headed by a maiden, BEE JERSEY, owned by Charles Fipke, who had turned in a pair of solid placings at Meydan. But he had no trouble repelling the challenge and drawing away with relative ease. He is a very attractive colt with four white ankles and, although his stride looked smoother on grass than the higher action on dirt, he handled the new surface well, even remaining on his left lead. He has quite a mixed pedigree, by an Australian-bred sire out of an English-bred mare, who is inbred to Nureyev and whose maternal great-grandsire is Affirmed. Godolphin still would love to win the Kentucky Derby via the Dubai route, and they’ve been trying since they purchased Worldly Manner and got a brief thrill at the quarter pole in the 1999 Derby. Bee Jersey made a big move to storm to the lead, while going a bit wide, but was unable to match strides with the winner while finishing well clear of the third horse. LeComte Stakes winner GUEST SUITE, who had a brief stay in the Top 12 and no doubt will be back soon, showed his sharpness, breezing a half in :47 4/5 for the Feb. 25 Risen Star Stakes, second fastest work at the distance. Trainer Neil Howard said he’s seeing some physical positives with him and that he is holding his weight very well and developing the right way. One horse who will be getting a lot of attention in the Risen Star is the Steve Asmussen-trained LOCAL HERO, a 7 1/4-length wire-to-wire maiden winner going a mile and 70 yards. The son of Hard Spun tuned up for the race with a 5-furlong work in 1:00 4/5. Fair Grounds is never lacking for 3-year-old races, and this Saturday they will run a pair of races at a mile and 70 yards – an allowance race and a maiden race that drew several promising prospects. Dallas Stewart was so high on SAINT’S FAN, a Louisiana-bred he owns and trains, he entered him in the LeComte Stakes after two career starts and wins, only to scratch because of an outside post. He found a much easier spot in Saturday’s Louisiana-bred Premier Night Prince Stakes at Delta Downs. Sent off as the 3-5 favorite, he could finish no better than third, beaten 3 1/2 lengths by the Birdstone colt UNDERPRESSURE. At Fair Grounds, the Tom Amoss-trained SHAREHOLDER VALUE, fifth in the LeComte Stakes, worked a sharp half in :48 for a possible start in the Risen Star Stakes. Turfway Park’s 3-year-old series got under way with the 6 1/2-furlong WEBN Stakes, which was won in fine style by the Hansen colt EN HANSE, who won wire-to-wire, rattling off dazzling fractions of :22 2/5, :44 4/5, and 1:09 1/5, stopping the clock in 1:15 4/5. Todd Pletcher has so many Derby hopefuls now it normally would be less than fulfilling if you don’t get at least four or five of them there. But Pletcher knows as well as anyone how many brilliant 3-year-olds in January and February don’t make the Derby. The latest to come out of the woodwork is the Bernardini colt THIRD DAY, who despite not having run since his debut victory going 5 1/2 furlongs July 31 at Monmouth Park, was able to score a game victory in the one-mile Just One More Stakes, which, for Pletcher, is appropriately named. Last year’s Belmont Futurity winner THEORY, who was rushed into the Breeders’ Cup Juvenile off only two six-furlong sprints and finished at the back of the pack, breezed 5 furlongs in 1:01 4/5 at Palm Meadows. Continuing on the Pletcher front, ALWAYS DREAMING, a son of Bodemeister who broke his maiden by 11 1/2 lengths at Tampa Bay, turned in a bullet half-mile breeze in :47 4/5, fastest of 18 works at the distance. By the way, 17 of those half-mile workers were trained by Pletcher, who appears to have the run of Palm Beach Downs. Also, the Pletcher-trained MASTER PLAN, winner of the OBS Championship on the all-weather track at Ocala, breezed his half in :51. Recent allowance winner CHIEF KNOW IT ALL will step up to stakes company in the Southwest Stakes February 20 and take on Uncontested, PETROV, ROWDY THE WARRIOR, and WARRIOR’S CLUB, the first four finishers of the Smarty Jones Stakes, as well as Breeders’ Futurity and Iroquois Stakes runner-up LOOKIN AT LEE, who was fourth in the Breeders’ Cup Juvenile and will be making his 3-year-old debut, and the Tapit colt SILVER DUST, an impressive maiden winner at Churchill Downs last fall going a mile. Another newcomer to the stakes scene will be HENCE, who scored that amazing maiden victory on Jan. 16. Trainer Steve Asmussen said the son of Street Boss has a lot of talent and believes he will “run great” in the Southwest. He attributes his ducking in badly to the reflection from the infield video board. Despite getting beat 5 3/4 lengths in the Smarty Jones, the feeling here is that Petrov is still one to watch as he progresses on the Derby trail. I have liked everything I’ve seen of this horse, who appears to be very competitive and gives 100 percent every time. I loved his maiden victory at Churchill Downs, and he was the only horse who made a run at Uncontested and finished well clear of the others. In watching his three races, when you ask this horse to go, he lowers his head and goes. To demonstrate his sharpness, he breezed a sharp 5 furlongs in 1:00 flat. The Southwest is an intriguing race that could easily produce more than one legitimate Derby contender. And Petrov is right at the top of that list. SO CONFLATED, in whom we went into in great detail last week and could be a real sleeper in the upcoming Santa Anita Stakes, breezed 5 furlongs in 1:01 1/5 at Santa Anita. Could he be the first Golden Gate/Tapeta horse to make an impact on the Derby? Or maybe it will be stablemate ANN ARBOR EDDIE, who will have the services of Mario Gutierrez in Saturday’s El Camino Real Derby. HURACAN AMERICO, winner of the group 1 Derby Nacional in Peru is targeting the Florida Derby, with a possible prep in the Fountain of Youth Stakes. Trainer Dante Zanelli Jr. followed this path in 2008, when he sent his Derby Nacional winner Tomcito to Gulfstream, where he finished third in the Florida Derby, beaten 12 1/2 lengths by Big Brown. Huracan Americo is a son of 2010 Belmont Stakes winner Drosselmeyer.